I accidentally posted the cover of Russell Thorndike's novel The Slype twice, so I deleted that one and I'm covering this anthology instead. Two of the three stories have crossovers. The first is John L. French's "Wolf Hunt," in which the Nightmare (aka Michael Shaw) sacrifices his life to save Leda, the woman he loves. Lieutenant Jerome Easton receives the news that the hero died while battling a gang war in Coast City alongside an unidentified pink-clad vigilante. Thinking that vigilantes have been thought dead before and later turned up alive, Easton then reminds himself that the Whispering Monk did truly die. Easton goes to the bar Moran’s, owned by Seamus Moran, searching for the Nightmare. Contemplating giving his equipment to Easton, Shaw, who has been resurrected, thinks, “Maybe he’d don the mask and gloves, wield the .45s, and go join Gordon in Chicago.” Hannibal Tomas, a hired gun out of Harbor City, murders a witness to a crime committed by gang boss Wolf Hopkins’ men, and kidnaps the man’s sons in order to persuade his wife not to testify. One of the two boys asks the Nightmare, who has come out of his short-lived retirement, if he is “the guy on the radio?” The hero laughs, and thinks that he’ll have to tell Kent. Later, he thinks, “That’s why people like Kent, Richard, and I wear the black and haunt the night. When the law fails, when justice is thwarted, there is always vengeance, and we are the ones who can mete it out.” The Nightmare later confronts Tomas as he comes out of a Harbor City bar called Dave’s Place. The Nightmare is French’s own creation. Leda, also known as Nemesis, is from Patrick Thomas’ Murphy’s Lore and Terrorbelle books. The pink-clad vigilante is the Pink Reaper, the Nightmare’s cousin, who first appeared in Thomas’ book Lore and Dysorder: The Hell’s Detective Mysteries. The Nightmare worked with Nemesis and the Pink Reaper in French and Thomas’ collection From the Shadows; the final story in that book, “Defying the Odds,” featured the Nightmare and the Reaper becoming involved in a gang war in Coast City, with the Nightmare ultimately sacrificing his life to save Leda’s, and then being brought back from the dead. The Whispering Monk was the subject of a titular story by Gordon E. Warnke in the June 1934 issue of the pulp All Detective Magazine. The Nightmare avenged the Monk’s death in the first story in From the Shadows, “The Woman in Black.” Seamus Moran is the cousin of Paddy Moran from the Murphy’s Lore books. Both Seamus and Paddy are leprechauns. 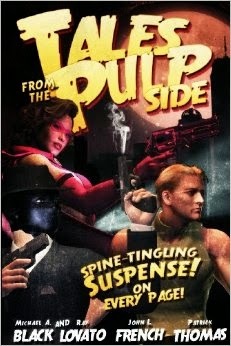 Gordon is Police Commissioner James “Wildcat” Gordon, aka the pulp hero known as the Whisperer. The Chicago reference is incorrect, as the Whisperer operated out of Gotham City, although he retired in 1941, leaving the city in the capable hands of the Batman. Hannibal Tomas is a member of the Tomas family from French’s book The Devil of Harbor City, which also details Michael Shaw’s final battle with Wolf Hopkins. Dave’s Place is also from The Devil of Harbor City. Kent is Kent Allard, aka the Shadow, while Richard is Richard Wentworth, aka the Spider. In Patrick Thomas' "The Games People Play," the Pink Reaper (Kaye Chandler) cannot imagine Detective Mydnight or the Nightmare shivering in an alley in a skimpy outfit. Kaye’s uncle was a brilliant inventor: “It was even said that Dash Chandler had been approached in a recruitment effort by a man with a team of experts with their headquarters in Manhattan’s tallest skyscraper. The leader of that team had been shocked when Dash not only turned down his offer, but wasn’t the least bit impressed by him.” Detective Mydnight is an original character created by Thomas. The man headquartered in Manhattan's tallest skyscraper is Doc Savage.